When Google launched SearchWiki two years ago, the new icons seemed distracting and I even wrote a script that removed them. After a while, I disabled the script and I used the new interface for a week or two. SearchWiki icons no longer seemed distracting and I started to ignore them. After clicking on the new icons a few times, I realized that SearchWiki's features were quite convenient and I liked promoting results, adding short annotations or removing irrelevant results. 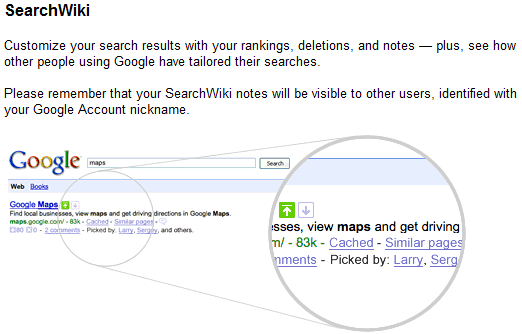 Google added an option to disable SearchWiki 6 months after the launch, but I no longer wanted to disable it. If Google added that option on the launch day, I would've disable it and never looked back. If the new Google interface seems distracting, try to use it for a week and you'll realize that the sidebar doesn't get in your way. Focus on the list of search results and look at the sidebar only when you want to refine the results. Before jumping to conclusions, try the interface with an open mind and you'll learn to like it. Pity they got rid of the option to remove irrelevant search results and promote others, replacing them with starred results in searchwiki. A backward step for advanced search in favor of 'simplicity'. True, i'm used to it now but there should still be a show/hide toggle like there was before. The new UI is great. I just don't like that it doesn't stick around for the images search. Maps could really do without it (it's not there but I'm just saying). No, that sidebar is annoying. I have tried other search engines with sidebars and other crap - that's why I used Google. I've blocked the sidebar with Greasemonkey, but I don't know what i'll do at work. I wish there were a swappable CSS that would allow for the page to be centered or run full width resolution for larger monitors. I feel as if I am craning my neck a bit to see things with everything shifted so far to the left of the screen. What I like is the page previews feature, but I am wondering how fast to they create the thumbnails. I was more prone to demote a result than promoting one. For example if you do a search query and notice some web spam, it was easy to demote it. I'm happy with the new sidebar. For me it's a great way to get grouped results. I"m often looking for a certain type of result when I search or there are many result types I'm not interested in. There are a couple problems though. The first is I only see the new interface after I've searched so it never becomes familiar. It would be nice if Google would unify their interface so it's easy to move around Google land. The second problem, for me, is the neutering of SearchWiki. It doesn't mean as much to me that I can group and crudely filter search result types if I still get junk at the top. Promoting and removing search results is the single coolest feature I've seen in search engine land in forever. It took control out of SEO manipulators and put a lot of it back in the hands of the searcher. It also seems like a no brainer for data collection; you get search data on what users explicitly like or don't want to see. For me the new icons are too colorful and distracting. The trend elsewhere (Windows 7, Ubuntu, Apple) with such icons is to make them colorless, and add color only where you need people to pay attention. Bookmark the following link. It will give you the old "Show Options" menu on the search results pages. Unfortunately, seems that Google has already disabled that workaround. I guess they really do not want us to have any say in this.